The small village harbour is full of small boats and is a main focus of the village. On a clear day you can see the Caithness hills across the Moray Firth and the sunsets are spectacular. There are local festivals organised in and around Gardenstown throughout the summer. The beach lies to the west of the village where adults and children alike can enjoy walking, exploring or generally relaxing. There are two streams that run down from the cliffs into the sea. Dolphins, and sometimes even whales, can often be seen in the bay. Puffins, herons and an abundance of other bird life have made the beach and surrounding cliffs their home. At the far end you can walk up the hillside to the historic St Johns Churchyard, said to have originated in 1004, which sits proudly overlooking Gardenstown. The churchyard can also be accessed by road on the outskirts of the village. The local pub - Garden Arms - sits at the end of the Main Street where you can enjoy a leisurely drink in a traditional atmosphere. Food is also served. Also in Main street is Gamrie Larder which offer a range of produce - deli items, burgers, sausages, fish, bread, milk, etc. They also stock fishing rods, waterproofs, gift items and much more. Fresh coffee, teas, cakes and pies are also served or available to take-away and you can pick up a newspaper on a Sunday. There is also SPAR shop with Post Office at the top of the village where you can find all your essentials. Directly on the harbour is the Harbour Restaurant. It has limited opening times usually weekends. Booking is essential as it is very popular. The Heritage Centre on the harbour opens every afternoon except Sundays during the summer. They have collected many artifacts and have a large selection of photographs which tell some of the history of Gardenstown. In Newground there is a local craft gallery and tearoom with home bakes – Newground Gallery & Tearoom. They have a lovely range of scarves, paintings, jewellery to mention just some of the arts and crafts on offer. There is another small shingley beach to the east and at the end you will find the ‘Snook’. This is a pathway around the cliff leading to the adjacent village of Crovie. 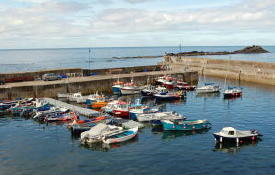 Crovie, with its lovely historic pier is located eastward from Gardenstown. It can be accessed by road or a short walk along the pebble shoreline and through the ‘Snook’, tide permitting. It is a unique village built on a ledge at the foot of the cliffs. There is parking at the end of the villages but the cottages can only be accessed on foot along the coastal path. A little further east you can find the village of Pennan and it’s harbour made famous by Bill Forsyth’s award winning film ‘Local Hero’ in 1983. The telephone box, a main feature of the film, still remains. There is a hotel, with bar and restaurant, where you can enjoy a pint and a meal on your travels. There are numerous activities for enthusiasts of all kinds, walking, fishing, birdwatching, seatrips to observe the staggering array of wildlife to name but a few. There are also many cultural and visitor centres which provide a wealth of information and a great deal of fun. Please visit our LINKS section which will to connect you to some of the activities and attractions available in the area.